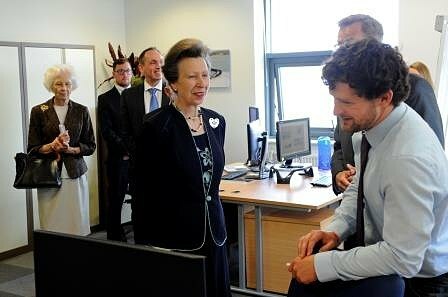 Vectis Marine Design recently had the honour of a visit to our offices by HRH The Princess Royal. Princess Anne, The Princess Royal was visiting Fareham Innovation Centre as part of the celebrations for 100 years of flying from the former HMS Daedalus air base on which the Centre is located. The Princess Royal was hosted by John Fox-Robinson, Technical Director of Vectis Marine Design and she was briefed on the design process for complex, weight critical military craft.